Welcome to the start of a new weekly Clash of Clans series, featuring the best base design layouts for the home village and Builder Base. 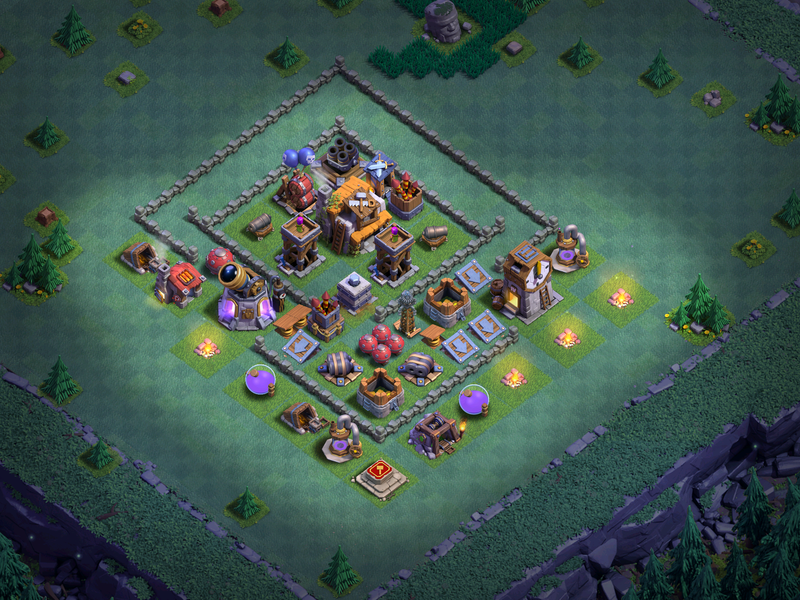 Today, our featured base layout is a BH5 design, that relies on an anti-three star design. This base is the best to use for Builder Hall 5 to defend in versus battles! Welcome to the new Sunday series, and I hope you guys enjoy the base designs! When you unlock Builder Hall 5, you unlock the multi-mortar which is one of the most powerful defenses in Clash of Clans, being able to dominate giants, archers, night witches, and barbarians! To utilize this awesome new defense, you need give it good location in your base so that it can cover the entire layout. In this base, it is almost impossible to reach, being protected by walls. Without further ado, here is “The Slant”, our BH5 base layout! As you can tell by the trap locations and pathing for troops, this base is a strong troll base. Taking advantage of weak Builder Base AI, the 2 spaces of walls at the top will reroute giants (the most used strategy at BH5) to the bottom of the base where quadruple mines, the mega mine, and the crusher all await! Also, since the multi-mortar sits at the top of the base, way out of reach, it will likely be active the entire versus battle, giving you strong support when you need it the most. Even if your opponent is able to breach the first set of walls, all 4 spring traps are pointed out, making the troops have to suffer through the minefield again. This Builder Hall 5 base, while being weak against a 1 star, will go the distance in protecting against 2 and 3 stars! That’s all for our first weekly installment of daily base designs. I hope that all of you BH5s out there can use this base to wide success, shooting you up in trophies! If you want to see a base design for your BH or TH level, comment below which. Thanks for reading and come back soon for more Clash of Clans! Pingback: Best Builder Hall 5 Base Design Layout: “The Slant” | Clash of Clans Guide, Strategies, Tricks and More!